To give our bodies the best possible chance of healing and fixing what’s broken, we want to make sure that the tough job of digestion is completed before we go to bed. 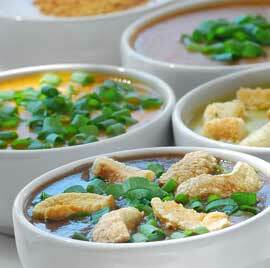 Soups, since they are usually easy to digest are ideal for an evening meal. If you eat flesh foods, you are best to eat them before 3:00PM, to give your body plenty of time to digest them before hitting the pillow. Soups are a staple in our house, especially in the colder months. I like to make a lot and freeze some. Beans and legumes freeze well. Vegetables don’t freeze as well, especially potatoes (they also get usually eaten too fast). A lot of soups are made with meat stocks; chicken, beef, veal; and it wasn’t until I worked in a vegetarian restaurant that I really perfected meatless vegetable broth based soups. I found that the secret is onions. You need to add a lot. I rarely see any recipes with the quantity of onions I like to use. When you think you’ve added too many, add some more. There are also certain aspects of these recipes that are hard to quantify. For example the amount of water used will depend on many things; from how long the soup cooks to how high the heat. Salt and garlic are two other ingredients that are very taste dependent. I tend to like the garlic to not be too overpowering. Whereas my wife and two daughters like to eat garlic raw with oil on bread. It’s a question of taste. Remember the cardinal rule – You can add more but you can’t take away. So go easy. You can always add more salt or water, but it’s a little tricky to remove them.